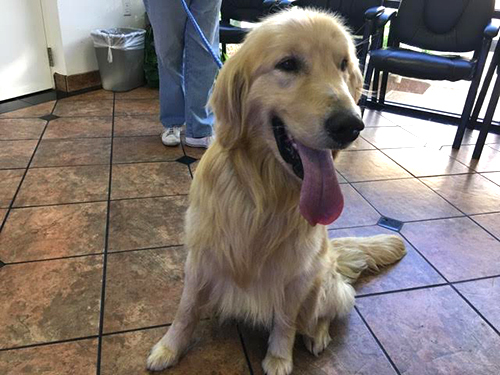 Adami, the one-year-old Golden Retriever who was saved from a butcher shop in Korea earlier this year, is now fully healthy and ready to begin his new life in Southern California. Adami, on the day of his healthy departure from the hospital to go to his foster home. Adami arrived in Southern California with a severe and lethal case of heartworm. He was treated for several months by the Animal Medical Center in Los Angeles and has stayed with a foster family recuperating since then. The Tess McIntyre Foundation made a $2,000 donation to help with the cost of Adami’s treatment and hospitalization. The most recent series of tests show that Adami is now heartworm free. He has started monthly heartworm prevention medication. He is also being neutered and will receive some training to socialize him with other dogs, something that became necessary because of his isolation and immobility while being treated. Once those steps have been taken, Adami will be available for permanent adoption. The foster family who have cared for him since the Spring will have first option to adopt as they have bonded with him since his arrival in the U.S. However, if they choose not to keep him he will be put up for adoption by Southern California Golden Retriever Rescue, the organization that arranged for Adami’s rescue and transportation to the U.S., and for his medical care and temporary accommodations. If Adami goes for regular adoption, SCGRR should be prepared for hundreds of applications, as Adami is a stunning pup, and now very healthy. Best of luck to Adami on finding his “furever” family. The Tess McIntyre Foundation, a 501(c)3 charity, raises funds to support rescued dogs who need medical care to ready them for adoption. You can donate to the foundation and support its efforts to help other animals like Adami at the organization’s web site http://www.tessmcintyrefoundation.org/.